However, I missed the free and easy freelance lifestyle so have gone back to the ways of a roving mercenary and am now working for myself once again. Got some funky features in the pipeline – an upcoming article on a recent interview I cut with Patrik Antonius where he talks at length about playing poker in Macau for sick sums of money. I’ve sold that to Poker Player mag in the UK and it will be their cover feature in a couple of months – I’ll post the link up when it gets published. However, I have decided that Asia is where it’s at currently, both economically and poker-wise – the game is taking off out here in a big way. This means my first port of call is obviously Macau (where else can you get poker action this crazy in Asia?) 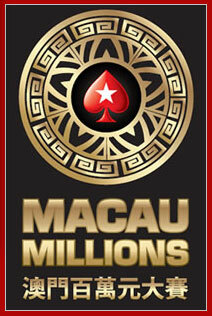 and I am in the midst of covering the Macau Millions for Poker Portal Asia. Day 1A is about to get underway and I have me a ring side seat writing about all the action. With a HK$1.5 million (roughly £119,642 or US$192,850) guaranteed prize pool and seven (yes seven…) starting Day 1’s and an estimated 1,000 entries it’s looking like it’s going to be a pretty exciting tourny to cover. The thing that makes it most interesting is that players will make the money if they make it through to Day 2, and if they bust out on one Day 1, they can just take another shot the following day. If that’s not enough even players who make Day 2 but are not happy with the size of their stack can ante up again and take another shot at building a bigger one on another Day 1. Should they be fortunate enough to make Day 2 a second time then they play with their biggest stack and receive HK$8,000 for the smaller stack, which is then taken out of play. Some of Asia’s best and brightest are going to be in attendance including PokerStars Team Asia Pros Celina Lin and Bryan Huang so there should be plenty of fireworks, tantalising tournament action, and of course, some sick bad beats to cover. Watch this space for more updates – I’ll post up the links to the live tournament coverage on Poker Portal Asia just as soon as things get started. Right, well tournament director Danny McDonagh has just got on the mic and action will be getting underway in around 15 minutes so I have got to get to work. Until later folks.